Despite writing a great deal about comics, I've never set out to become a writer-about-comics. My goal has largely been the research and exploration of the comics, and writing is just a way to help facilitate that. And to help facilitate that, I've built out my own personal comics library to try to keep any research materials close at hand when I'm trying to write. Or vice-versa. I posted some pictures of my library when I first finished it a couple years ago, but I've kept adding to it since then and have a lot more filled shelves now! And I'm thrilled that I'm able to use it exactly as I intended! About once a week, I have an instance where I need to reference something or try to look something up, and I can just wheel my chair over and grab the appropriate issue or book in a matter of seconds. My editor at Jack Kirby Collector recently asked if I could turn in my next column a little earlier than usual, noting that this issue would have a 'partners' theme. Since it was a bit early, I hadn't given any thought to what I should write about yet, but with a lot of media attention on Captain America & Bucky recently, that was an obvious choice. A little too obvious, really, and so much has been written about written about them already, I wanted to do something else. So I decided I could with another pairing from around the same time: Sandman & Sandy. Like a lot of smaller pieces I write about, I actually don't have a comprehensive knowledge about the characters. I think I've read maybe two or three of their stories via reprints, and that's about it. But like I said, much of my writing is an excuse to do research! I thought I'd have to find/purchase an Omnibus or some of the Archive books here. Turns out, though, that I don't. 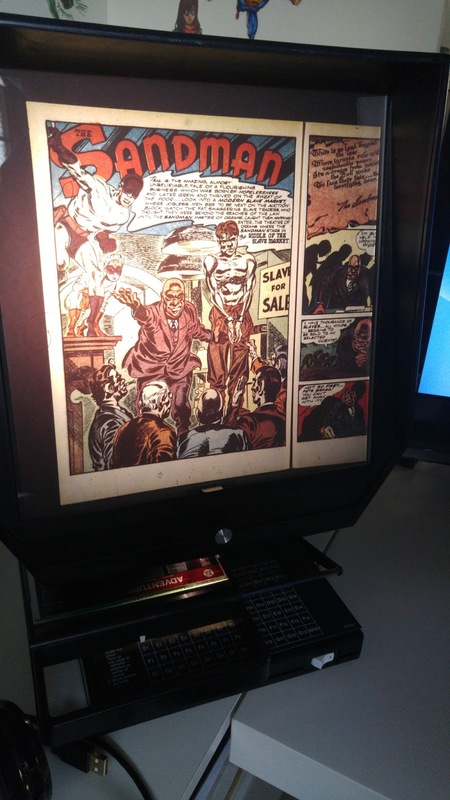 Because I have a decent run of Adventure Comics in microfiche form sitting on the corner of my desk. (Pictured.) Including, coincidentally, the issue they debuted -- Adventure Comics #69 -- and the first issues Joe Simon and Jack Kirby worked on -- starting with Adventures Comics #72. This is precisely how/why I wanted to set something up like this! With all of my comics materials within reach, it's phenomenally easy to get to what I need to -- even if I don't know I have it -- and cross-reference that with everything else in my collection! Now, of course, this isn't something every comics fan can (or even should!) do. It took me about a decade to get my collection to this point, and that was with my actively working towards it. But if you're specifically interested in reading through comics and books for research/historical purposes, I can't recommend strongly enough organizing and codifying your collection around how/where you write! "Oh, I have issues of that on microfiche. And I have a microfiche reader."